A soft, delicious cookie especially for the almond lover (that’s me!). The dough contains almond meal (ground almonds) and is flavored with almond extract. 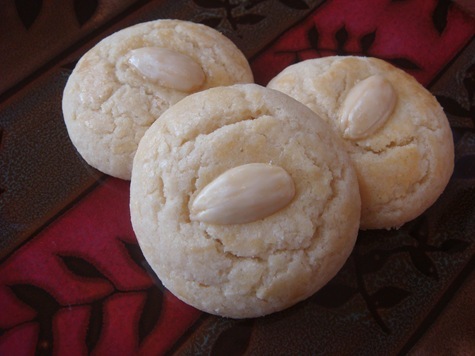 The cookies are then topped with blanched almonds before baking. A quick egg wash over the cookies gives them a great shine when they are cooked. Mix together the flour, baking soda, salt, and ground almonds. Set aside. With a mixer, beat the butter and sugar together until fluffy. Add the egg, water, and almond extract and mix well. Beat in the dry ingredients until just combined. Roll dough in your hands to make 1-inch balls. Place 1-2 inches apart on a parchment-lined baking sheet (or use a silicon baking mat). Press a blanched almond into the top of each dough ball. Using a pastry brush, brush the top of each cookie with the egg wash. Bake for 14-15 minutes. Bring a saucepan of water to a boil. Remove from heat. Add raw almonds to the hot water. Let sit for 1 minute (not longer). Drain and pour into a bowl of ice cold water. Let set in the water until cool (about 1 minute) Drain. Pinch almonds between your thumb and index finger to slide the almond out of its skin. Pat dry. Allow to dry completely before using in recipes. If you oversoak your almonds and they don’t dry properly: preheat oven to 200°F. Turn oven OFF. Place almonds on a baking sheet and put into the warm (but OFF) oven. Leave almonds in the oven for 15-20 minutes.